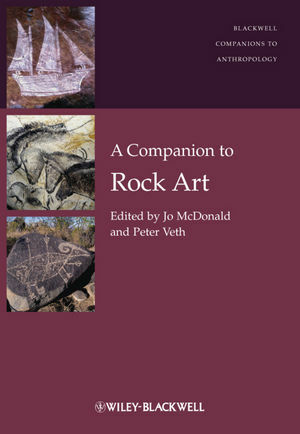 This unique guide provides an artistic and archaeological journey deep into human history, exploring the petroglyphic and pictographic forms of rock art produced by the earliest humans to contemporary peoples around the world. Jo McDonald’s career has combined cultural heritage management and rock art research. She is currently Chair and Director of the Centre for Rock Art Research and Management at the University of Western Australia. Her major research focus, funded by an Australian Research Council Future Fellowship, is comparing rock art of the Australian and North American arid zones. She is past-President of the Australian Archaeological Association and of the Australian Association of Consulting Archaeologists Inc.
Peter Veth’s career has focused on the archaeology of Australia and Island Southeast Asia; and on global desert peoples and art in archaeological context. Peter is currently Chair in Archaeology at the University of Western Australia, an Adjunct Chair at the Australian National University, and Fellow of the Australian Academy of the Humanities. Beginning with Islands in the Interior, he has published twelve volumes on the archaeology, art, early contact history, and native title of Australia and Island Southeast Asia. Peter has coauthored Plans of Management, National Heritage Listing reports and Outstanding Universal Values reports for art provinces in Australia.